It’s now approaching late summer, and the majority of summer blockbusters have come and gone. Now we are in the hit or miss month of August, a time usually reserved for films not capable of going toe to toe with films like Man of Steel or Iron Man 3. August is a time of winners and losers, but every once in a while the Hollywood system throws us a bone while leading us into the film wasteland of September. This year’s August is shaping up quite nicely with the release of 2 Guns. The story isn’t very important in 2 Guns. Suffice to say it follows a case of mistaken identities between two undercover officers who run into the bad graces of the CIA. 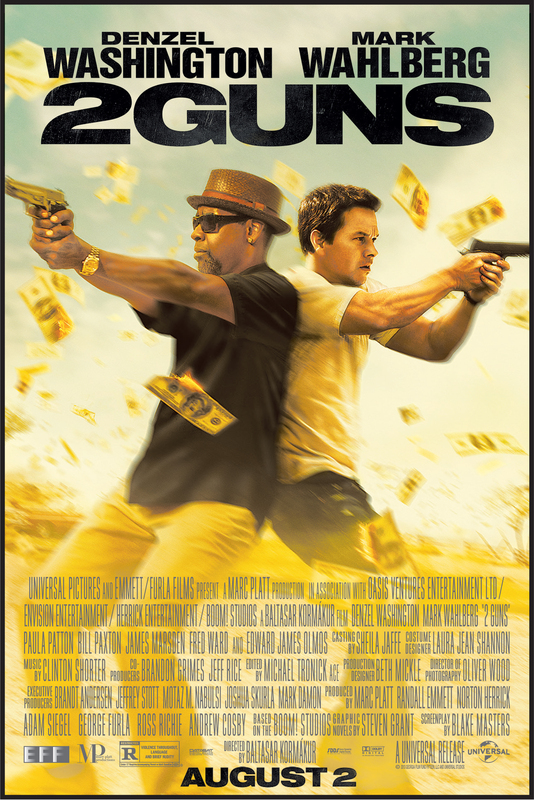 At first glance we are lead to believe that Stig (Mark Wahlberg) and Bobby (Denzel Washington) are two criminals who want to rob a bank, but we learn quickly that both of them are working cases to end the operations of a drug kingpin. However, when both of them are set up, they must continue their ill advised partnership in an effort to seek justice. The story isn’t important because the draw of the film isn’t the sloppily laid plot, it’s the pull of the two actors with genuine chemistry that elevate this bombastic film. To say that this film would be nothing without its leads would be insulting to Wahlberg and Washington. It’s not a pairing one would immediately sound plausible, but the chemistry is palpable. Both actors bring a matching set of charisma and charm not found in many recent buddy cop films. Wahlberg continues to show his comedic chops that mesh well with his believability as an action star. Washington continues to be ageless as he exudes his cool demeanor throughout the film. The pairing is like two notes existing in harmony. 2 Guns plot is enough to keep interest in the film, but ultimately forgettable after a day or two. The film’s story is overshadowed by the talented cast. The direction is surprisingly deft, and pulls no punches. Director Baltasar Kormákur, despite being Icelandic, creates a very solid American action film. He doesn’t shy away from the action, but doesn’t leave his characters without proper characterization. There isn’t much that is believable in the film, especially when the main characters are in a seemingly inescapable situation for the sixth time, but Kormákur somehow manages to bring it to a whole other level. Many would describe 2 Guns as a simple action film, but it’s well worth the price of admission because of its cast and exciting action. It’s full of action cliches, but never enough to make you groan. It’s a perfect film to signal the end of summer.